What is A Psychedelic Circus? In the purest sense, it is an experience. With fractal projections and liquid lights dancing along the walls, live artists and face painters, this immersive atmosphere goes beyond the typical rock show. A key feature of this performance is that once the show begins, it doesn’t take pause until it’s over. 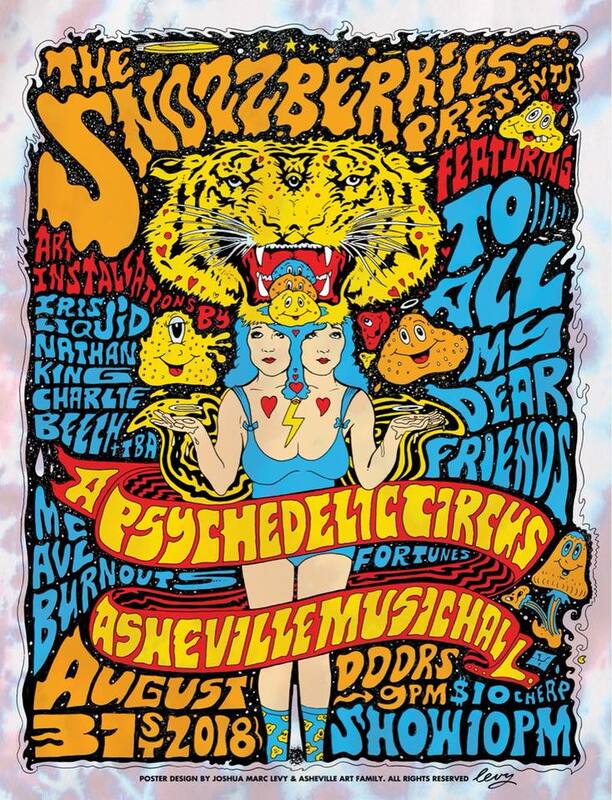 Interspersed between music from psychedelic rock band The Snozzberries are interludes from Asheville’s busking sensation To All My Dear Friends. The Master of Ceremonies is AVL Burnouts, whose cosmic hilarity will set the tone for a magical evening. Combining psychedelia, funk and fusion in lively whirlwind of sonic pleasure, The Snozzberries are Asheville’s freakiest musical pioneers. This high-energy powerhouse channels the head-bobbing grooves of Vulfpeck, the oddity of Primus, and the intensity of Umphrey’s McGee. Come join the party where the jams are fresh and the vibes are dialed in just right.